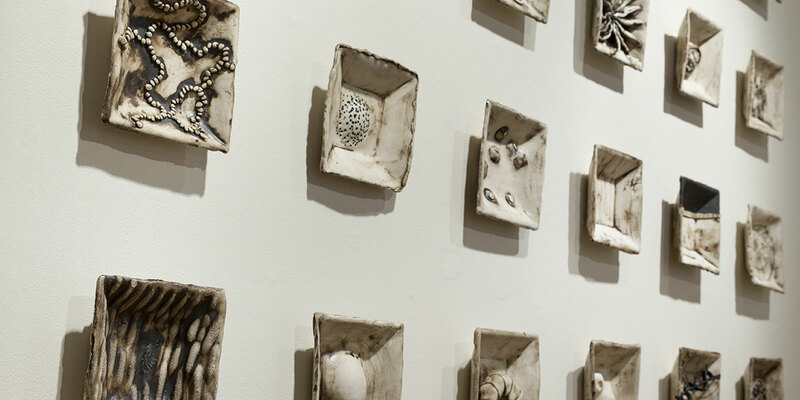 The opening exhibit at the Factory Mark Gallery highlights the work of Cambridge, Massachusetts-based sculptor and ceramist Michelle Lougee. Lougee’s work, Anthroplastique, reflects the increasingly precarious relationship with the planet. The pieces follow themes and share iconography that flow from one panel or piece to the next. Lougee uses mediums including ceramics, collaged and sewn paper, and her signature material, crocheted post-consumer plastic bags, for a new look at our habits, ourselves, and our precious planet. Lougee’s work often seems otherworldly. She draws parallels between underwater and microscopic worlds. The thread among all of the work is the integration of nature and contemporary consumerist society. Michelle Lougee has exhibited recently at Boston Sculptors Gallery, Chesterwood, The Christian Science Plaza, The Peabody Essex Museum, The Qorikancha Museum in Peru, the Kunstverein Tiergarten in Berlin, and The Trustman Art Gallery at Simmons College. In addition, Ms. Lougee teaches sculpture and drawing at Lesley University.